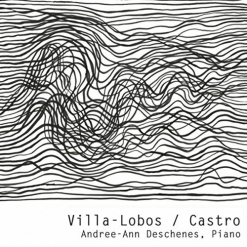 Villa-Lobos / Castro is the third release from classical pianist Andree-Ann Deschenes, an award-winning and critically-acclaimed performer known for her exploration of cross-cultural composers. This album features the four-movement “Ciclo Brasileiro” by Brazilian composer Heitor Villa-Lobos (1887-1959), the five-part “Tangos para Piano” by Argentinian composer Juan Jose Castro (1895-1968), and a bonus track by Cuban composer Jose Maria Vitier (b. 1954). All but the bonus track are dazzling piano solos, and the closing piece is a collaboration with percussionist Calixto Oviedo. The music is varied and often quite spirited, occasionally employing what I interpret as touches of humor. On the more “serious” works, Deschenes’ touch is very expressive, employing just the right amount of drama, power and/or grace. As colorful as the cultural traditions that inspired the music, Deschenes’ interpretations are vibrant and full of life. 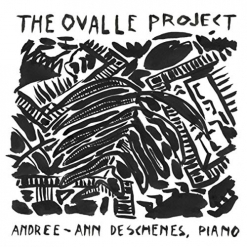 Andree-Ann Deschenes is a French-Canadian pianist who has performed extensively across North America and Europe. She holds a Master of Music degree in Afro-Latin music from California State University in Los Angeles and is pursuing a Doctor of Musical Arts degree at Claremont Graduate University. Villa-Lobos’ “Ciclo Brasileiro” was composed in the later 1930’s. The first movement, “Plantio do caboclo (The Peasant's sowing),” has a repeated pattern in the treble range of the piano while most of the melody is played a bit lower. The piece is slow and seems to carry the weight of hard work under a blazing sun. “Impressões seresteiras (The Impressions of a serenade musician)” is a passionate, dramatic tale. “Festa no sertao (The Fete in the Desert)” begins as a wild celebration, calms to a more somber mood, and then pulls out all the stops, swirling and dancing with abandon. “Danca do Indio Branco (Dance of the White Indian)” has a fast, frenetic rhythm that evokes images that are sometimes mysterious and sometimes playful - an amazing piece! The five Castro Tangos are somewhat lighter and shorter, and each is a gem in its own right. “Evocacion” is a dark, spare prelude that suggests the beginnings of a mysterious dance. “Lloron” casts a seductive spell as it spins its tale, and Deschenes’ touch is often playful. “Compadron” has a steadier march-like rhythm mixed with a humorous attitude and a sense of fun. “Milonguero” has a discordant edge that blends strangely with its playful demeanor. “Nostalgico” turns very dark and ominous, suggesting a multitude of possible scenarios - a delight! The bonus track is “Festiva” by Vitier, performed with Calixto Oviedo. What a fun piece this is! The piano part is obviously Latin, but it reminds me of faster, showier ragtime pieces. The percussion adds even more joy to the exuberance of the music, bringing this excellent album to a close. Villa-Lobos / Castro is a pianistic tour de force and I am really looking forward to hearing more performances by Andree-Ann Deschenes! The album is available from Amazon, iTunes and CD Baby. Highly recommended!